When practicing drumming exercises (or learning them for the first time) should a drummer start them slowly and build the tempo up gradually until they can play them quickly and smoothly? 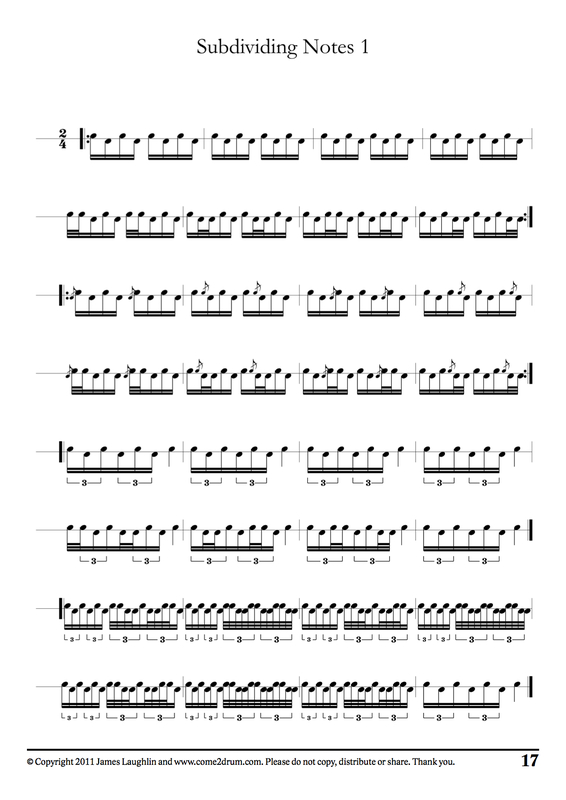 Or should the rudiment be structured in a rhythmic grid to give the drummer a more contextual sense of how the rudiment fits into the phrase of a piece of music? A pretty easy question you would think, right?! Well, I’m not exactly sure if we could get all pipe band drummers to agree on this one. Let’s take doubles for example. Should they be learnt slowly and built up steadily into an open roll? Or should they be learnt in crotchets, then quavers, then semi-quavers and so on. (And of course quarter notes, eighth notes, sixteenth notes etc. for all you numerical folk!)? Personally, I was taught to start them slowly and gradually build them up in tempo. This was fun, because as a beginner I could track my progress almost daily and then push myself to go a little faster. Although, there does comes a time where you start to make only incremental improvements as your stick position or technique physically hinders your progress. This is where the danger comes – a student might get miffed with the rudiment side of things because they aren’t able to go any faster. So what’s the point in practicing them if they don’t see results (or at least this what a lot of students think at times perhaps?). The other downside to this way of “mastering” rudiments is that the player gains no understanding of time or rhythm. They become a speed demon, but surely this is not a drummers key role? The other way of approaching it is to start with a very slow tempo on the metronome and start doubles as crotchets, quavers and so on. This is a great way of understanding the value of time and how the rudiments fits into the metric equation. This is also a good way of learning to play to a metronome (or constant beat) and allows the student to measure their progress with a metronome BPM count. I guess the downside to this one is that the student doesn’t get the excitement of building the rudiment up steadily into the closed roll. Frankly, I think both ways have merit. And in fact, I use both ways with students. Some students grasp to one easier than the other. But I feel it is so important for them to be able to play both. In my Guide to Pipe Band Drumming Volume 1 – I demonstrate both. You can choose what works for you. Or maybe you have another method? If so, please do share! I totally believe in watching videos or listening to tracks that make you feel good or act as a source of inspiration. A clip I go back to often is the 78th Fraser Highlanders Pipe Band – Walking the Plank medley, from the 1998 World Pipe Band Championships. Musicality, excitement, innovation, tone … it has it all. As drummer’s – our key role is to keep consistent time for the other members of our band. Understanding basic music theory is a great tool to help drummers with their time keeping and musicality. I strongly encourage all of my students to learn the basic note values, rests and time signatures. I also ensure they work hard to tap their foot whilst they drum. A great exercise to understand note values and in particular sub-dividing notes, is the attached exercise sheet. It’s an excerpt from my Guide to Pipe Band Drumming Book, Volume 2. Why not give this sheet a go!? Get your very own copy of the Guide to Pipe Band Drumming book at www.come2drum.com. What to do in the pipe band off season…? 100’s of you pipers and drummers have finally completed the 2012 Pipe Band competing season…and what a magnificent season it has been – I have personally enjoyed the great music produced by so many great pipe bands from around the World. Now the big question we have to ask ourselves is… how long of a break will we take before getting back into the routine of band practice? The thought of “pipe band free” weekends is like a dream for you all – actually spending some time with your family, rather than your pipe band “family”. Personally – I do enjoy the winter down time with my family and friends, and getting into other projects that have been cast aside for 6 months. However, I know there is a fine balance between having a “break” and going backwards. Rest – take a month off to enjoy some other non pipe band activities and to reinvigorate yourself. Recruitment – looking at new players to join the team and bring a new dynamic and experience with them. Development of Technique – the winter season provides you with the time to work on individuals, hone in on technique issues and develop the corps musically. Composition – the leaders of the band can use this time to plan the musical journey for the season ahead. This is such an important and time-consuming task. Picking the right music is extremely important – not only the skill level of the music, but also how they flow together. Socialising – its super important to keep the team together during the off-season, planning quiz nights and fundraising events can be very productive to keep a sense of community within the band – and also a chance to raise some $$ for the band. Does anyone else have any suggestions on how to use the off season?